When I was dating my wife back in '95, there were two sleeping quirks she had to deal with. I slept all night with a fan on, no matter what season it was, and I fell asleep each night to the radio. She not only learnt to live with the fan, but she now requires the fan for a good night's sleep. We've had a fan blowing on us every night of our marriage. The radio habit, however, had to go. My night time ritual of cruising my station presets and falling asleep with the sleep timer on ended when we got married. Last night I decided to dust off my good 'ol Sony mini-system and set her up in the bedroom. I cruised the dial and added 20 FM presets, just as I did as a teenager. 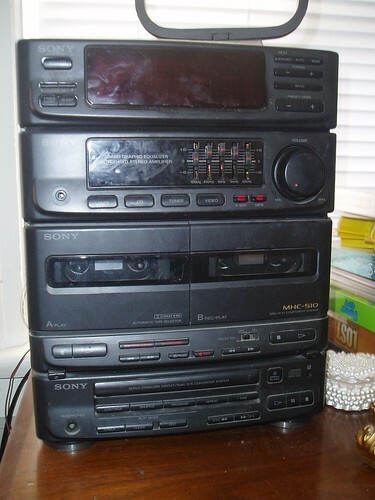 This stereo is about fifteen years old but everything works great except the CD player. It was sweet hearing her and seeing her again. I wonder if there's room for three in this marriage. We'll soon find out! Very funny. I hope it is good music for all three of you. My 12yr-old does the fan/radio thing and it drives me crazy. It could be -28C and he still has cold air blowing.